Since I have caught up on submissions for critiquing, now is a good time to pause and consider how to proceed with this weekly feature. My purpose is to provide a learning resource for aspiring writers. While the submitted pieces allow the authors an opportunity to see how they can improve, my hope is that others will also learn from the critiques and apply the lessons to their own pieces. As time goes on, I hope to see better and better submissions, because writers will be avoiding the mistakes they see in the works of others. In order to help make this hope come to pass, I am creating a list of the most common mistakes I have seen in the submitted pieces along with explanations and examples. Before you submit a piece for critiquing, please read this list and do your best to eliminate these mistakes in your writing sample before you send it in. I know that some of the listed mistakes might slip through. That’s fine. We will try to identify them and root them out, but it will help with the critiquing process if there are as few of these as possible. This way, we can concentrate on story issues that writers might miss because they are too close to their work. Events out of order: Be sure to report events in the order they occur, especially when one event is a character’s response to an earlier event. For example, “Sam ducked when Tom swung the bat.” Tom’s swinging the bat happened first, and Sam responded by ducking, so these actions are out of order. “Her stomach growled as the food cart passed by.” The food cart’s passing caused the stomach growling, so this is out of order. “The corridor grew darker as she walked.” The walking brings about the darkening of the corridor, so the order is wrong. One exception is when the POV character notices an event before the event that caused it. Then it is correct to report the events out of order. Telling instead of showing: When you are reporting a scene in real time, don’t tell conclusions; show what causes the conclusions. This is called, “Show, don’t tell.” Don’t tell us that a character is angry. Show the character’s anger through the clenching of a fist, the kicking of a chair, etc. Don’t tell us that a character is weakening; show the character weakening through buckling legs, pouring sweat, or dropping a load. If, however, you are writing a transition from one scene to another or summarizing, then telling instead of showing is fine. It is also acceptable to tell in real time if the telling is a widely accepted description that nearly everyone understands, such as, “She gave him a skeptical stare.” Although you would be “telling” that she is skeptical, readers generally know what such a stare looks like. Narrator phrases: When describing what a point-of-view character sees, hears, thinks, smells, etc, don’t include “she saw,” “he heard,” “she thought,” etc. That makes the prose sound like a narrator is relating events, and it hurts the intimacy of the point of view. Just report the visual, the sound, thought, or smell. Since you are writing in the character’s point of view, there is no need to add the narrator-like phrases. Participle misuse: In most cases, when you use a participle form of a verb (usually an “ing” form of the verb), you are describing an action that happens at the same time as the main verb in the sentence. For example, “Glaring at the coiled snake, she curled her hand around the sword’s hilt.” The glaring happens at the same time as the curling, so this construction works. But the following doesn’t work: “He opened the door, running from the room like a madman.” He can’t run from the room until after he opens the door. These two actions cannot occur at the same time, so the sentence needs to be rephrased, maybe like this: “He opened the door and ran from the room like a madman.” To learn more about participles, see this link. Starting with intense action: If you begin a story with intense action, readers have a hard time connecting with the characters or understanding what’s at stake. Include at least a short sequence before the action begins, something that will provide at least some insight into the characters, their purposes, and their motivations. Unrealistic Point-of-view observations: When you are telling the story through the eyes of a particular character, don’t describe details of things or people a character sees frequently and wouldn’t pay attention to. He won’t notice the curtains, the texture of the walls, or the hair color of the apartment’s maintenance man. He especially won’t notice details about himself, such as the color of his own hair. He will, however, notice changes to the norm, such as a line of ants crawling along the wall, a rip in the curtains, or that the maintenance man shaved his head. He might also notice unusual movement, such as the first songbird of spring alighting on the tree, which gives you the opportunity to describe the tree or the bird. Look for such natural opportunities to provide descriptions from the character’s POV. 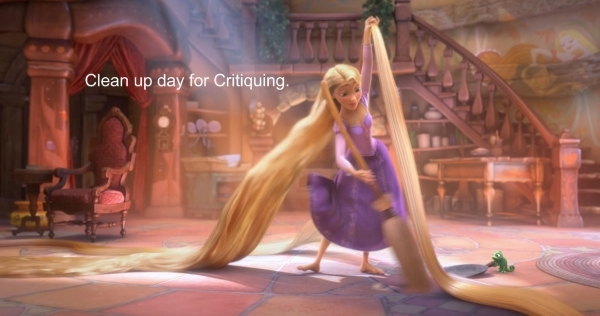 Not ready for critique: Don’t submit something that you haven’t already edited yourself. Show that you care enough to work hard to correct as many mistakes as possible. Those who critique here are offering a free service. If you send something that you haven’t worked hard on yourself, why should you expect them to work hard for your benefit? I reserve the right to reject any writing pieces that are sent in for critique. I might not even give the reason why I reject one, but the most likely reason will be a violation of #8 above. I will look forward to what you send in the coming weeks. Remember the other rules in this post. I wish I had something to send in, but my WIP has already undergone extensive editing, 😉 and I don’t really have anything else that’s cleaned up enough. One of these days . . .
Great tips! I’ll have to double-check for these in my editing. Sorry I haven’t been very active in the critique group lately, BTW. Life has been rather busy of late. >.< I’m hoping to send in some of my own stuff for critique soon, though. Is it possible to send in another piece if I have sent in one already? It’s not necessarily a piece for critiquing (though people can if they want), its just a funny piece that I wrote as an add on for a series though I don’t consider myself as good as the author. Thanks. I prefer submissions that are for critiquing. Thank you for asking. I will be saving this! I also say that you were trying to get rid of clothing from your books; do you have any from Dragons/Tales of Starlight? I know this is a bit late to the party, but I’ve been doing a lot of critiquing of late, and I’ve been sending a couple new writers your list. It’s quite helpful. Great. I’m glad it’s been helpful. Thanks for this list! I have a pile of stories I need to critique and didn’t have a clue where to start until I stumbled across this!